The late ancient tomb of Silistra is part of the Tentative list of Bulgaria in order to qualify for inclusion in the World Heritage List. The late roman tomb is Silistra is a small, almost forgotten place (there are few visitors in Silistra, which is, first of all, a border town with Romania), but it is a real gem. Visits are only with a guide and have to be arranged some days before the planned date with the Archeological museum of the city. Visits are limited to preserve the paintings inside the tomb, but my feeling is that there are not so many visitors anyway. On a Monday morning in August 2018 we picked up our guide in front of the door of the museum (closed on Mondays) and drove together to the Roman tomb. A recent building protects the tomb, so you need the key (and therefore the guide!) to get inside. The tomb is a one room construction, laying in the basement of the modern building, but big enough so one can stand inside. 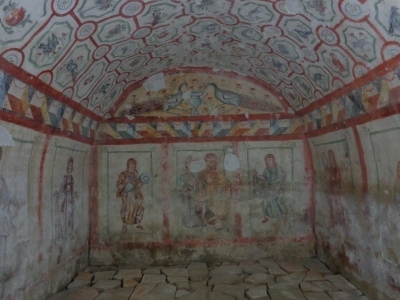 Internal walls of the tomb are fully covered with paintings. I was astonished to see how bright the colours still look like: red, green, blue… In front of the door are represented a man and his wife (probably the ones the tomb was intended for), and on the side walls, servants are shown bringing them clothes, belt, mirror, etc. The ceiling is covered with small drawings such as birds, animals, flowers. With the exception of one hole in the ceiling (the tomb was discovered during agricultural works on the surface), it is intact. For unknown reason, this tomb was never used. Owners may have die somewhere else, or run away invasion (the tomb was built in the late Roman period, when the Empire was already suffering invasion, and Silistra, for being on the border (Danube was the roman limes at that time), was a very exposed place). Romans founded Durostorum (nowadays Silistra) and it was an important place for them, with a Legio to protect it and guard the border of the Empire. Part of public baths can still be seen in the city, as well as part of roman fortifications and early Christian church in the park on the banks of the Danube (a component of another TWHS), however this late roman tomb is the building that shall not be missed when visiting Silistra. Being able to visit the original place (and not a replica as for some Thracian tombs in Bulgaria), with a private guide opening the gates just for you, and standing with a lamp in your hand to admire the paintings are details that make this short visit memorable.